The Collections Systems Committee (CSC) facilitates the advancement of standards and methods used for the design, construction, operations, maintenance, and management of wastewater collection systems in the Pacific Northwest. We have presented collections workshops and webinars such as Effective Sewer Line Cleaning, submitted articles to the PNCWA Newsletter, and sponsored Collections Systems Pre-Conference Workshops and Technical Tracks during the PNCWA Annual Conference. We meet bi-monthly via conference call to conduct committee business. For more information and to be included on these future calls, please contact Committee Chair (contact info below). Our committee is currently evaluating a preconference workshop for the 2019 conference in Portland, OR. The intention will be to organize a number of experts in the field to present on Collection Systems Design 101, a primer specifically geared towards younger EITs and PEs who may be looking to get into the design of collection systems and looking for hints and best practices. This will also be an opportunity to explore more how design impacts operations (and vice versa), and to get a broader understanding of how other disciplines (such as permitting and property) impact the design of these systems. Check back later this spring for more details! 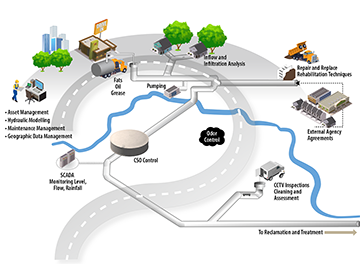 "Collection systems" refers to the system of underground pipes and maintenance structures that are used to convey wastewater to a wastewater treatment facility. The use of collection systems has brought dramatic improvements to public health in major cities. Most sewers carry wastes from households and commercial establishments and are referred to as sanitary sewers. EPA estimates approximately 500,000 miles of publicly owned sanitary sewers with a similar expanse of privately owned sewer systems. Continue—see for yourself!